Ahhh, gardening. For many, it's a celebration of spring. For others, it means cost savings, self-sufficiency, fresh vegetables, social gatherings, and physical and mental health. We all have our own reasons for gardening! Even a garden gnome would agree that it's better to have a small, flourishing garden that's easy to maintain than a huge one with weeds that looks run-down and makes you want to stop working on it! The best solution is to choose a small section of land that gets a lot of sun. If you want, you can always expand it next year. It's totally feasible to start a garden with less than $100. So forget raised beds and fancy fences, start with the basics! 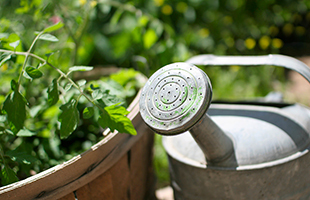 A hoe, a small garden shovel, some plants, some seedlings and a watering can--that's all you really need! Preparing baby plants yourself can help you save a few bucks and you'll also have the option of growing rare, old or heirloom varieties of plants. However, if we're into the month of May, it might be a little too late to improvise. When growing seedlings, you need to make sure they have enough light, so the stems don't get too long and fragile. Basically, leave the interior growing to intermediate gardeners or experts! Buying baby plants and planting seedlings is the way to go. For the best results, you need the right nourishment for the soil's microorganisms, which in turn provide the plants with elements and nutrients to help them grow. If you're in a hurry to get your garden going, you'll appreciate water soluble synthetic fertilizers (a well-developed chemical solution). If you've got more time, you can choose organic mineral-rich options, such as commercial composting products or animal manure. Chemical or biological--to each their own! You can also save money by creating your own composting material. You can opt for brown matter that is rich in carbon like dried leaves, paper and cardboard; green matter that is rich in nitrogen like vegetable scraps, grass clippings, and weeds that have not yet gone to seed; or other ingredients that are just good for the soil like egg shells or ash from wood. Don't forget that composting is an aerobic fermentation process: you need to move things around to get oxygen flowing! So how do you get started? Keep it simple. Manually remove the grass from the section you've identified for your garden or (if you have a few weeks before planting) stop the grass from growing by placing an opaque tarp over the identified section. What's the number one garden enemy? It's not insects or diseases, especially if you're using companion planting and biodiversity to create a stable mini-ecosystem. No, the number one enemy of the lazy gardener is weeds! They come back year after year, waiting for fresh, nutrient-rich, watered soil to grow in. Take action by covering paths with straw, grass or rocks to limit their growth and stop worrying about them... some of them anyway. You're all ready to go! If you're still not sure about your own garden, a little garden gnome told me you can always get organic food baskets from local growers (check out what's available in your area on Équiterre). *Companion planting: planting different crops alongside each other to prevent or attract insects.